The process of muscle growth is a dynamic one. It involves the breakdown and subsequent regeneration of muscle fibres on an ongoing basis. 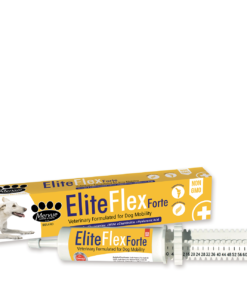 Every day, even under normal circumstances, muscle fibres are broken down and have to be replaced.When an animal is under stress, such as training or racing the rate of breakdown is substantially increased. 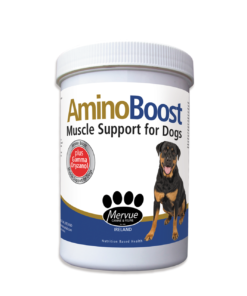 Thus the rate of replacement must be adequate to ensure the animal’s ability to recover and be prepared for subsequent competition.The whole area of muscle regeneration has been extensively researched for both humans and animals and the knowledge gained has allowed us to develop Amino Boost for dogs. Research has proven that in order for muscle growth, repair and regeneration to be optimized there are a number of key, essential amino acids required in sufficient quantities to allow the regeneration and muscle growth to be maximized. Equally when training a dog, the same essential amino acids are required for muscle development and growth. These amino acids are known as Branch Chain amino acids (BCAA). 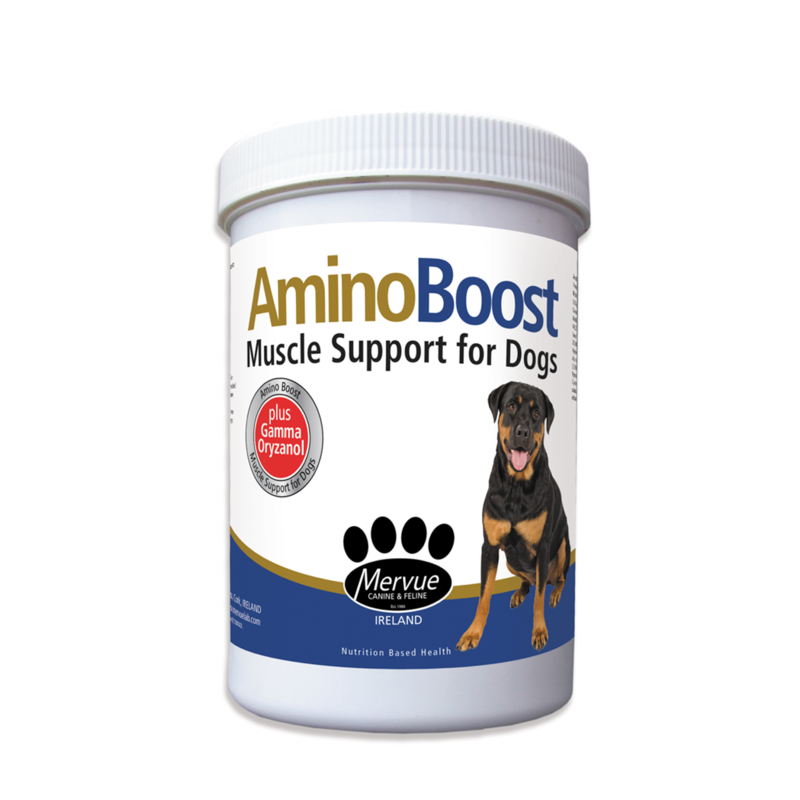 Mervue Laboratories have included Valine, Leucine and Isoleucine, at enhanced levels in Amino Boost product for dogs. Amino acids are absorbed most efficiently when in the form of small chains of the amino acids linked together. These are known as PEPTIDES. 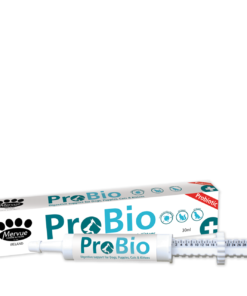 The process of absorbing them as short chains is much more efficient at getting the amino acid into the body without any loss of efficiency of the components. In the making Amino Boost Mervue Laboratories supplemented Amino Boost with specific Peptides, which are composed of these three BCAA’s. 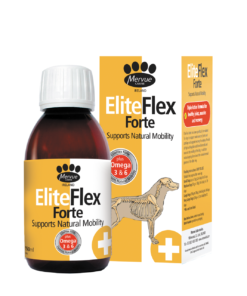 The net effect of all this research is the production of the most technically advanced and effective muscle enhancing food supplement in the world for dogs. 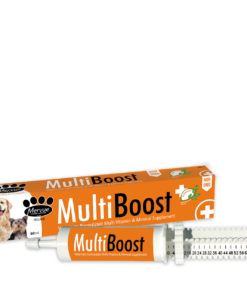 is recommendated for active working dogs, show dogs or dogs performing in athletic competitions. It helps them rebuild muscle mass lost during intense activities and activity level. 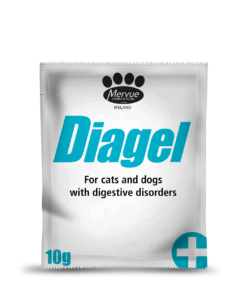 is an important nutrient that acts as a transport for fatty acids, essential for the cellular production of energy. 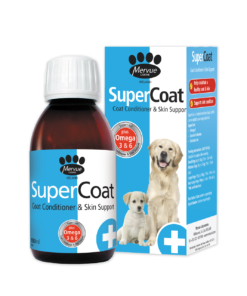 Deficiency of this nutrient can cause a variety of health problems for animals; most significantly, the association with heart disease (cardiomyopathy) in dogs. The heart and skeletal muscles do not synthesize the nutrient on their own, requiring it to be transported there for use. Because of this, when the body is deficient in carnitine, the heart and skeletal muscles are negatively affected. While carnitine supplements are not always able to reverse the effects of this deficiency, they have proven to be the most successful course of treatment. Is a natural component of the muscle contraction it increases physical performance in short bursts and high intensity exercise.